There were some works in recent years, but most visible of them is the increase in seat number in the main grandstand. That's not enough for a ground as vast as Yuba Bharati Krirangan, reportedly able to hold 120,000 people. This is why secretary general of Mohun Bagan, one of India's largest clubs, wrote a letter to West Bengal sports minister, asking for immediate investment in the stadium. As he writes, the artificial pitch is causing injuries to players, while supporters have no sanitary conditions to go to games – no access to both clear water and toilet facilities. To add to that, there were reports of power shortages at the stadium during games. So far no accidents were caused, but with large crowds left out in the dark, this is playing with fire. 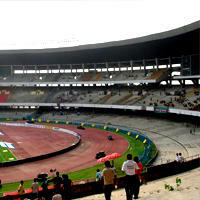 Lack of investment in the giant results in more and more games being relocated to a much smaller stadium in the Nadia district of Kolkata.